French officials hinted to Khalifa Haftar - the commander of the Libyan self-styled army - their support for his intended military operations to control Tripoli, London-based Al-Arab newspaper reported Saturday, citing sources close to Haftar. 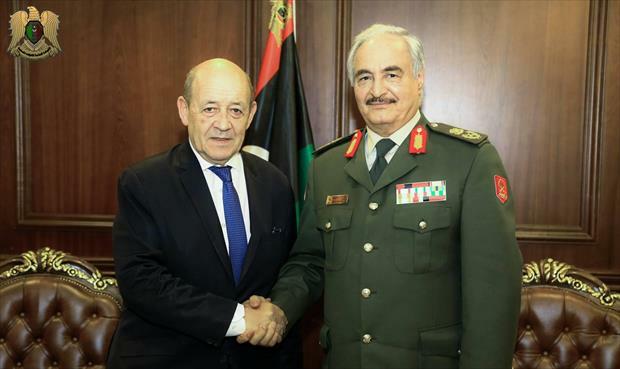 The newspaper said Haftar met with French officials, including the Foreign Minister, on the sidelines of Palermo Conference on November 12-13, discussing his intent to militarily advance on Tripoli and thus receiving a go-ahead signal from the French days later. "Haftar understood that France is in support for his military operations in Tripoli and that he will receive funds and political support from it, to be added to its previous support for him in Benghazi and Derna." The sources added. "He already started to lay down some military tactics for the operations. He was motivated by the French green light." The sources further added. Hafatr and his loyalist have more than once vowed to carry out a military operation in Tripoli in order to control it and "liberate it from militias." "France tried to urge regional powers to support Haftar in his move into the Libyan capital, but they had expressed some qualms and said the step could be seen as a coup." The sources explained, adding that France tempted Haftar into the move by saying it would urge the UN Security Council to partially remove the arms ban on Libya so his forces can be more prepared for the battle. France, out of other supporters, has been involved in Haftar's alleged war on terror in Benghazi and the rest of the eastern region, with many reports revealing that it had boots on the ground in Libya fighting alongside Haftar's forces in Benghazi, besides its backup airstrikes that had always helped Haftar gain more and lose less.